Austin’s Coffee imports raw, organic fair trade coffee beans from around the world. We have our own micro-roaster and are always roasting fresh coffee. Austin’s makes a variety of specialty coffee drinks and organic teas. We also have a delightful menu consisting of sandwiches, appetizers, salads, and pastries, many of which are vegetarian or vegan. There’s also plenty of chocolates and treats for your sweet tooth! Fresh bagged coffee beans, organic tea, beer, and wine are also available. 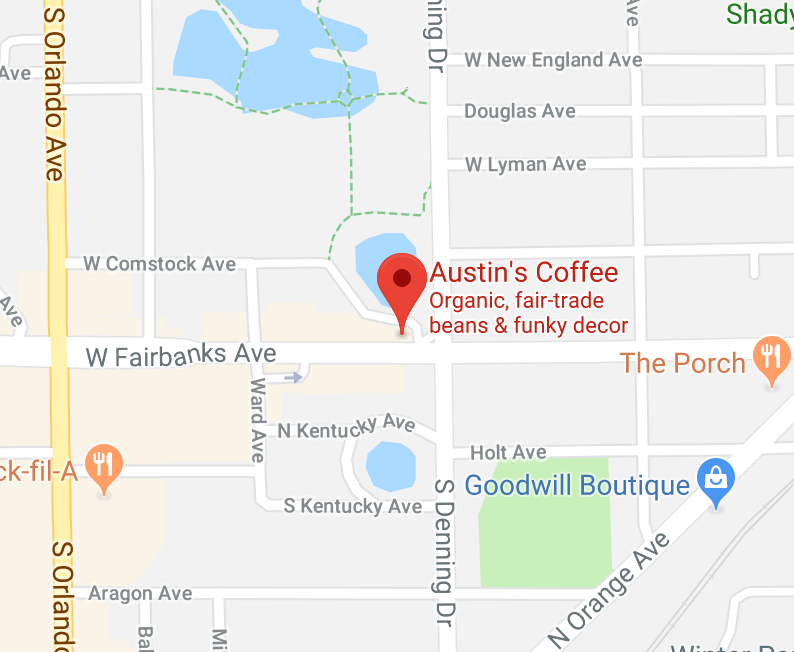 At Austin’s Coffee we reach out to local farmers and suppliers to keep business near home. We pride ourselves on our community and are sure to look for any of our ingredients or needs there first. From local produce and honey to nearby livestock ranches, we prioritize supply from the Central Florida region and our own backyard! This ensures all the food you order is as fresh as possible and good for your neighbors as well!